What's the cheapest way to fly from Perth to anywhere in Australia? After we managed to book a return Virgin Australia flight from Perth to Sydney during the Christmas break which is currently selling online for $811 using the Platinum Edge card, I decided to repost an older blog entry where we investigated this particular credit card deal which includes a free flight redemption from Perth to virtually anywhere in Australia. The American Express Platinum Edge card only costs $195 a year (as of April 2013) and includes a return flight to various cities in Australia on Virgin Australia as well as travel insurance for domestic flights and various other platinum services. However it is the return flight that I would like to focus on. It is impossible to get a flight from Perth to virtually anywhere for $195 return but the free redemption for Perth includes cities as far as Sydney, Melbourne and Brisbane with 23kg luggage. Don't you just love living in the West? Dealing with the AMEX flight redemption staff is very efficient and pleasant every time, with each representative taking the time to help you with checking what flights are available (apparently, they have about 14 seats available per flight for redemption, even when in one instance the website is saying "one seat left"). If just for the return flight, this Platinum Edge card is surely worth getting unless you don't see yourself making an annual return flight from Perth to anywhere in Australia (except Darwin - which is only available for redemption with the Platinum Reserve Card). Virgin also recently launched the Velocity Platinum cards which we reviewed earlier this year. 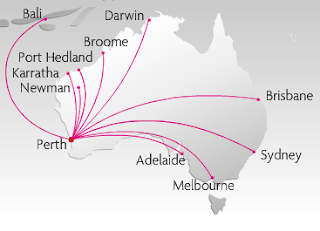 Flights from Perth available for this card only include Broome, Karratha, Newman and Port Hedland. If Qantas is your flavour, you will probably want to stick with the Qantas Ultimate card but that will cost you $450 / year with a return domestic flight with Qantas thrown in. I have applied for this card and verified that it is absolutly true!, the card holder can book a return trip every year for paying the annual $149 card fee. this is a fantastic deal! I am telling all my friends about it!